Notice the "hopper" above. It's an artificial fly. I personally would not eat this. But to a freshwater fish like a trout, this imitation looks like sashimi (AAA grade). Lunch is served!! At least that's what the fly fisher hopes the fish is thinking when the cast is made. Farmers look upon these creatures as locusts when they start eating up the crops. Bizarre food experts like Andrew Zimmern (T.V. 's Bizarre Foods) like them fried up with a side of something else strange. Fly fishermen think of them as protein for fish and cast all sorts of odd looking flies at them in the hopes for a "bite". If a swarm entered my house I supposed I'd be creeped out. But I love seeing droves of these guys along the North Platte or Yellowstone rivers during summer months. WOW!! There are several different types, including Bigheadeed, Migratory, Striped and Spottedwinged. Each varies in what it eats, where it sleeps, and how and with whom it travels. The differences pale to the similarities of Mr. Hipity-Hop. If you get too many of them in one place, look out. They eat like its their last meal. 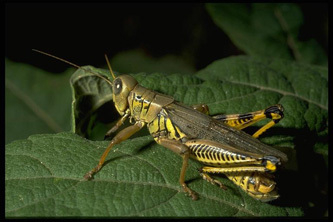 Like other insects, life starts from eggs, The hatch forms the nymph stage and adulthood comes to fruition in rather short order. Body length varies slightly from species to species, generally between 3/4 inch to one inch. Color varies also, from yellowish, to shades of green and brown. Here's a really interesting analogy: if Mr. Hippity-Hop were the size of King Kong, I'd be looking to King Kong as my protector. 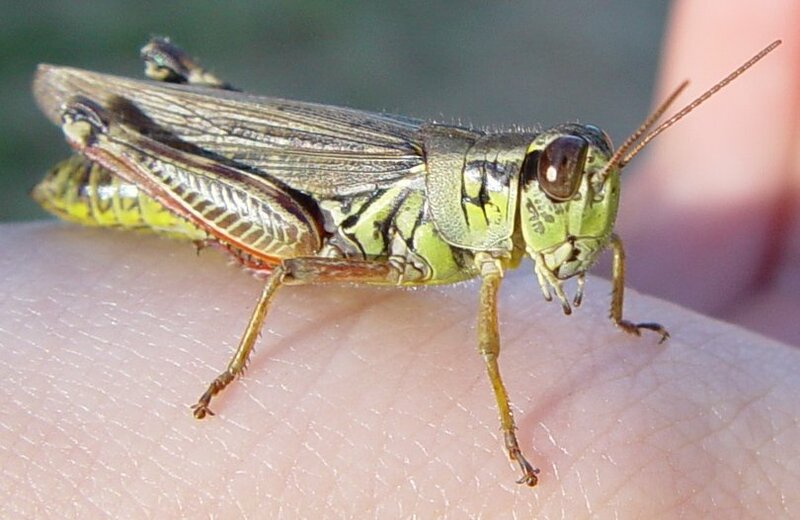 You would not believe the frightful size of the "teeth" of this insect. If you ever get the chance to look at one of these guys really close up, you'll know exactly what I'm talking about. When I was young, the only insect that scared me more was the praying mantis. But the mantis doesn't travel in groups of millions as does this bug. 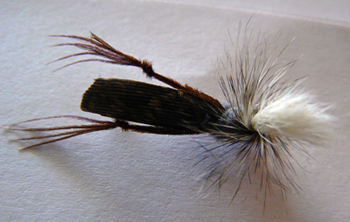 Click here to see our list of Click here for al list of POPULAR FLY PATTERNS from around the U.S.